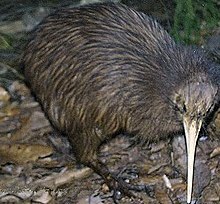 【鳥】 キーウィ 《New Zealand にすむ尾も翼もない走鳥で小型のダチョウの類》. A brown kiwi (Apteryx australis). A flightless bird of the genus Apteryx native to New Zealand. Alternative letter-case form of Kiwi (person from New Zealand). When used to describe people, Kiwi is usually capitalised. 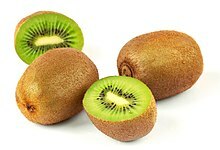 The plural is usually kiwis; sometimes, kiwi is found as an (invariant) plural form. Kiwi! is a 2006 computer-generated animation created by Dony Permedi, a student in the New York City School of Visual Arts, as his Master's Thesis Animation, with music composed and performed by Tim Cassell. The animation's story of a kiwi bird that aspires to fly created a major Internet phenomenon after it was hosted on the video sharing site YouTube.